Almost Ready for Their Forever Homes! 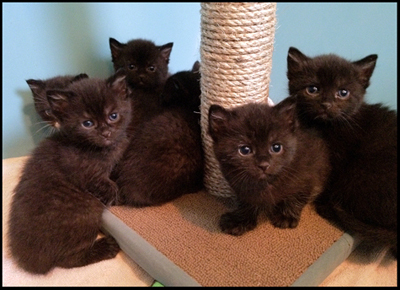 It's hard to believe that our little rescues from Trumbull are almost old enough to be adopted! Turns out we have ALL girls in this litter of six, super-sweet and silly kittens. Five of our six kittens. Sabrina, the only tux, is running around off-camera. Three of our six have extra toes! One has so many toes her paws look like baseball mitts! All the kittens have white fur in their ears, a scattering of white fur on their legs and bellies and two have cute white “eye lashes”! 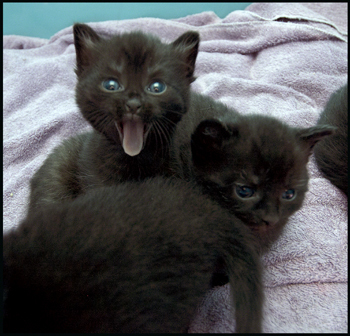 The kittens will begin to be available for adoption around the first week of June. We'll be posting these sweeties on our Petfinder page in the next few days and begin the process of accepting applications. If you don't want to wait, you can fill in an application HERE. Their mama, April, will also be looking for a forever home, too. April is very friendly and sweet and the best, most loving mama we've ever had. She has striking eyes, like to “chat” and needs some time to regain her former beauty and a healthy weight since she gave so much of herself to her kittens. Contact Animals in Distress if you're interested in April. Read more about Almost Ready for Their Forever Homes! 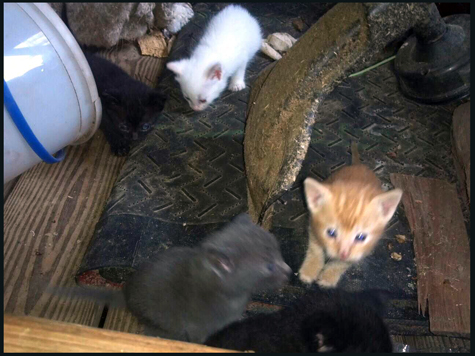 Five tiny kittens were living outdoors with their feral mom. They lived on scraps in terrible conditions. Even though we don't have enough room in our foster program, we knew we had to act fast and worry about logistics later. 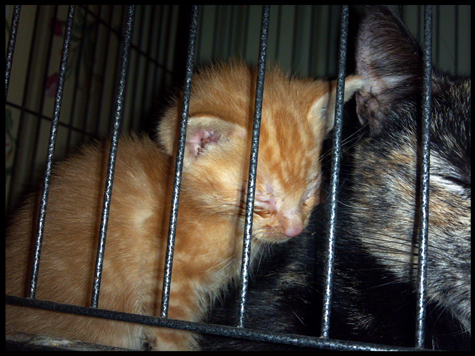 As it was, by the time we were able to intervene, two kittens were gone, never to be seen again. Our hearts were broken, but we had to press on to save the others because they were all getting sick. ©2012 Maria. S. The kittens as they were last week, when we thought we had time to find them a rescue, but now the gray one and one of the two black kittens are gone. ©2012 Maria S. Finally getting something good to eat! Help Fill Our Kitten's Bellys! The six kittens, and their mama, April, are all doing well. The kittens just turned four weeks old and are starting to lap at formula on their own. We're so happy to see the kittens thrive, but the older they get, the more costs will be involved with their care and we need your help. ©2012 Robin A.F. Olson. At four weeks. Use the ChipIn Widget, below, to make a donation for April's family. 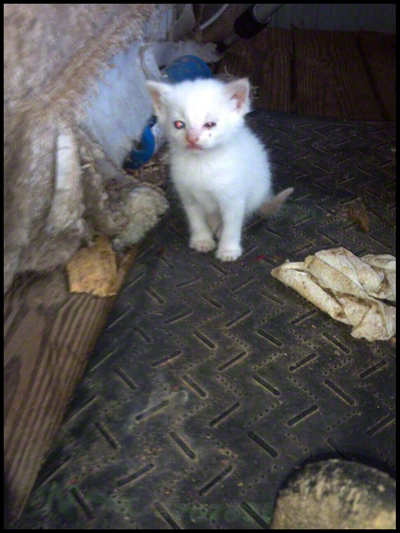 They'll need vetting (times seven) in the next few weeks and supportive care like cotton balls to help them eliminate, paper towels and cleaning supplies, kitten formula, baby food and new kitten-specific toys. ©2012 Robin A.F. Olson. I'm hungry! The donation you provide April's Family is TAX-DEDUCTIBLE. 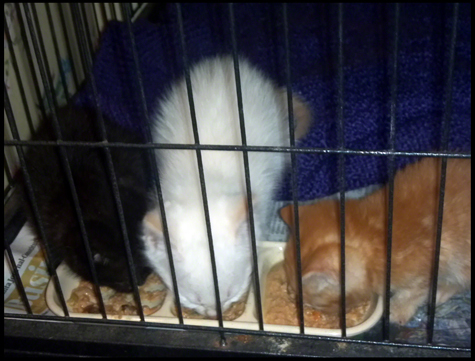 Read more about Help Fill Our Kitten's Bellys!